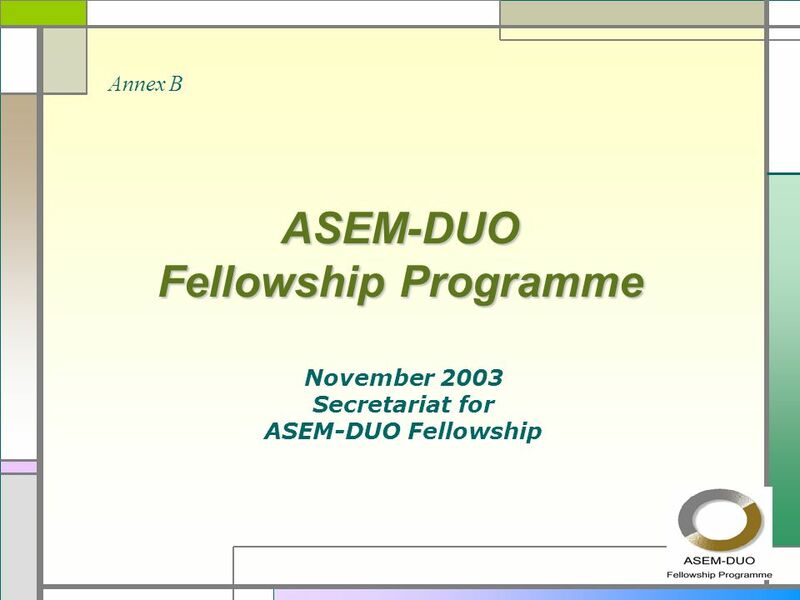 ASEM-DUO Fellowship Programme November 2003 Secretariat for ASEM-DUO Fellowship Annex B. 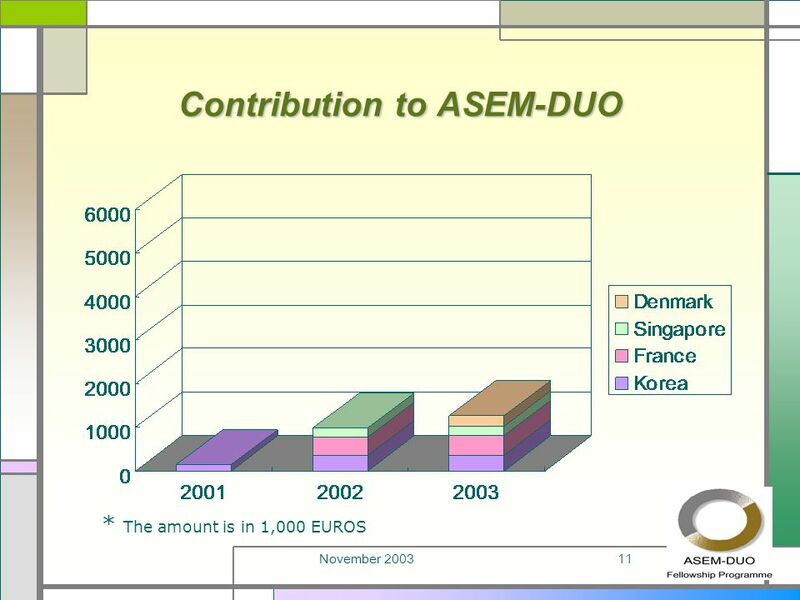 7 November 20037 Pairing under ASEM-DUO (country level) European countriesAsian countries Country A Country B Country C Country P Country 1 Country 2 Country 3 Country 10 These are the possible pairings, but donating country B may not be willing to support exchange pairs between countries C and 10. 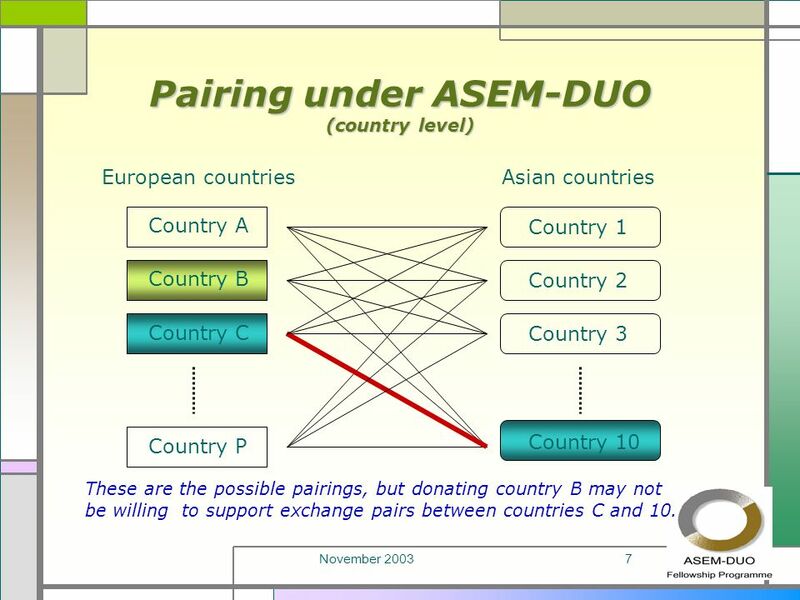 8 November 20038 Pairing under DUO-BBB (country level) European countriesAsian countries Country A Country B Country C Country P Country 1 Country 2 Country 3 Country 10 Thus, if Country B wants, one end of the pairing can be anchored at the donating country. 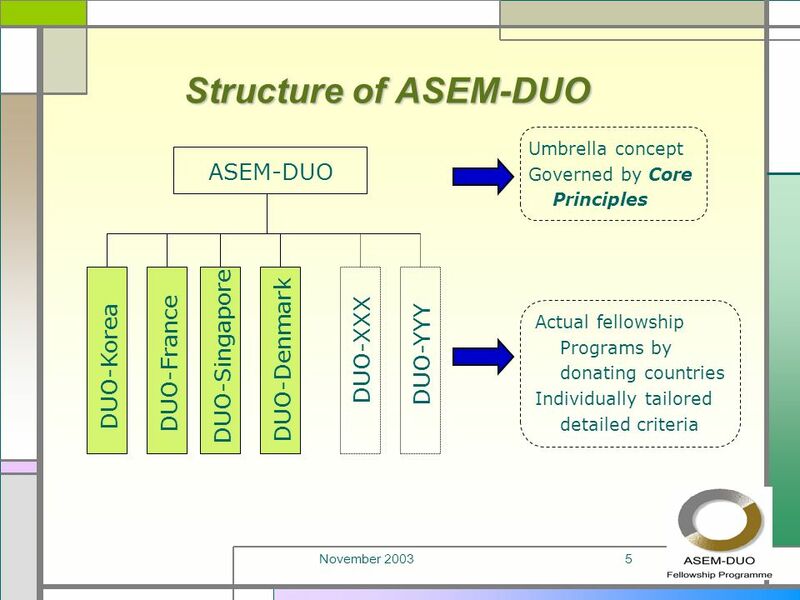 9 November 20039 Pairing under DUO-BBB (institutional level) Country B in EuropeCountry 3 in Asia University University i University m University ii University iii Bi-directional, or balanced, exchanges are supported. 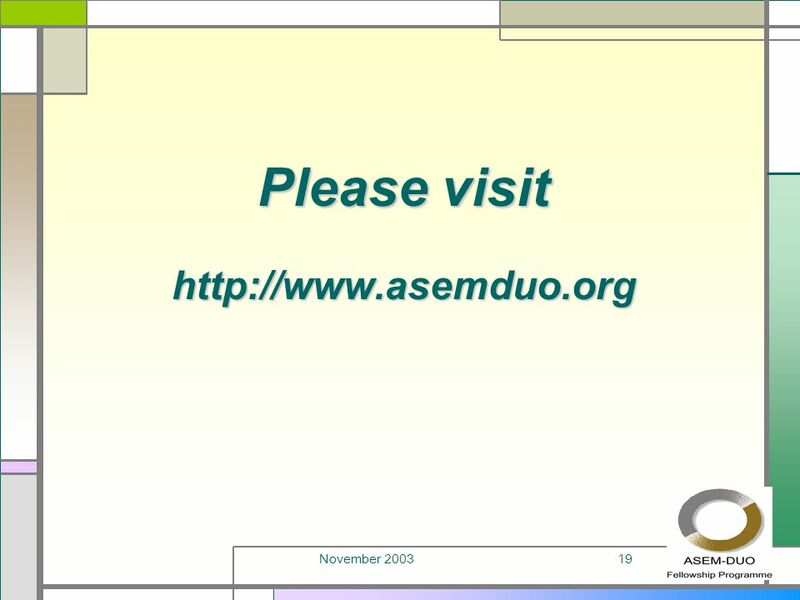 But one-directional exchange is not supported. 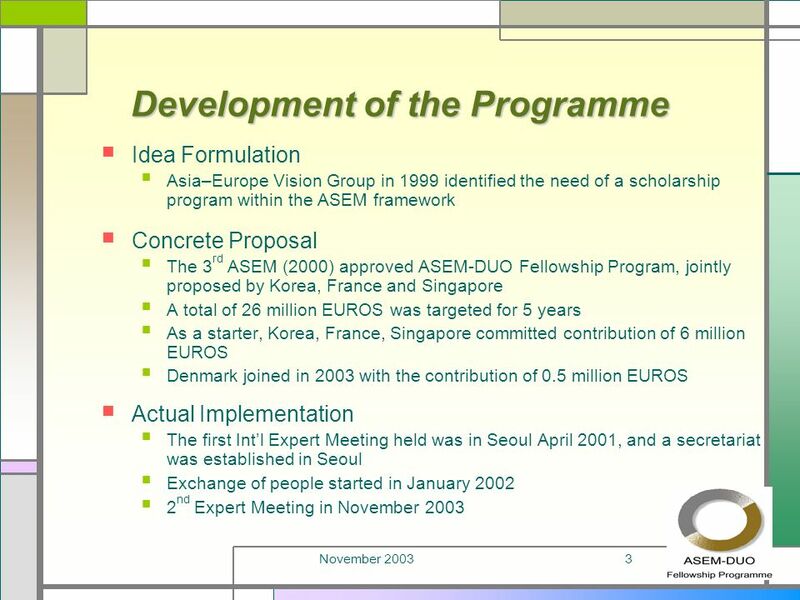 Download ppt "ASEM-DUO Fellowship Programme November 2003 Secretariat for ASEM-DUO Fellowship Annex B." 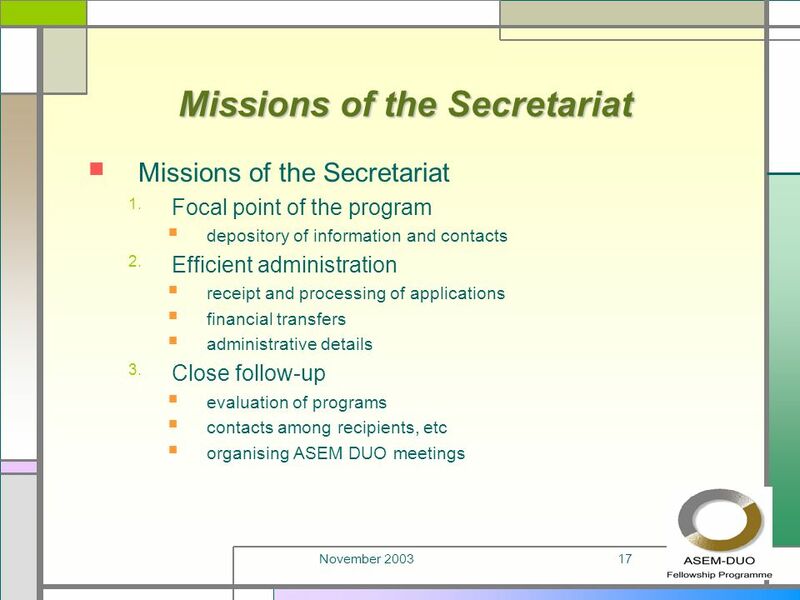 ILO Turin Centre, November, The IUFs Transnational Company Work. 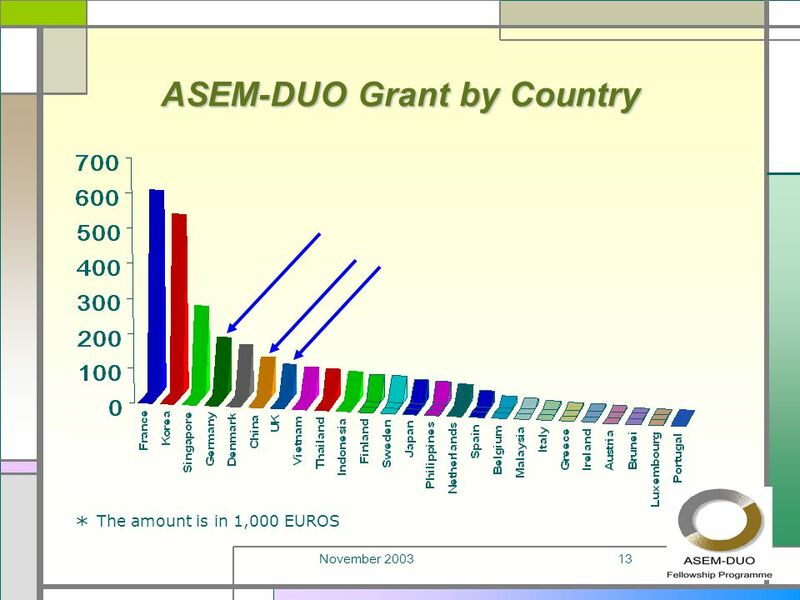 A. BobbioBertinoro, March 10-14, Dependability Theory and Methods 3. 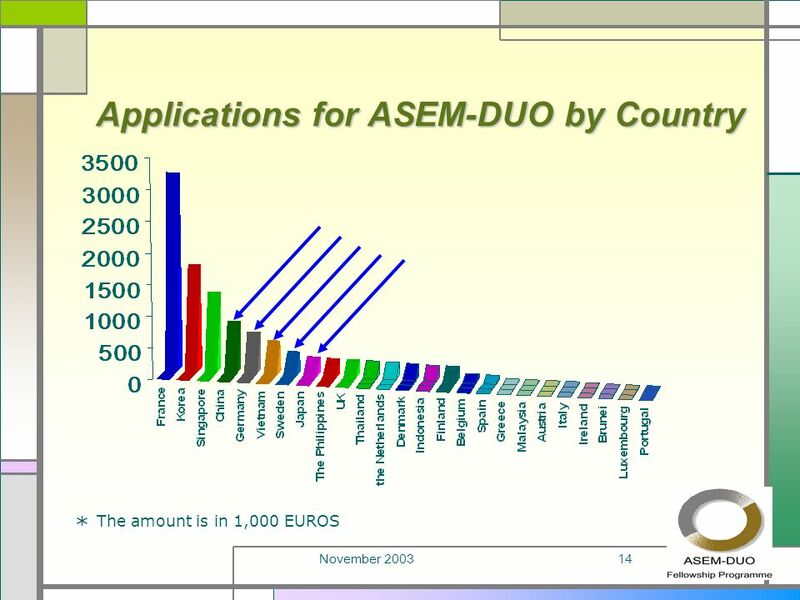 State Enumeration Andrea Bobbio Dipartimento di Informatica Università del Piemonte. 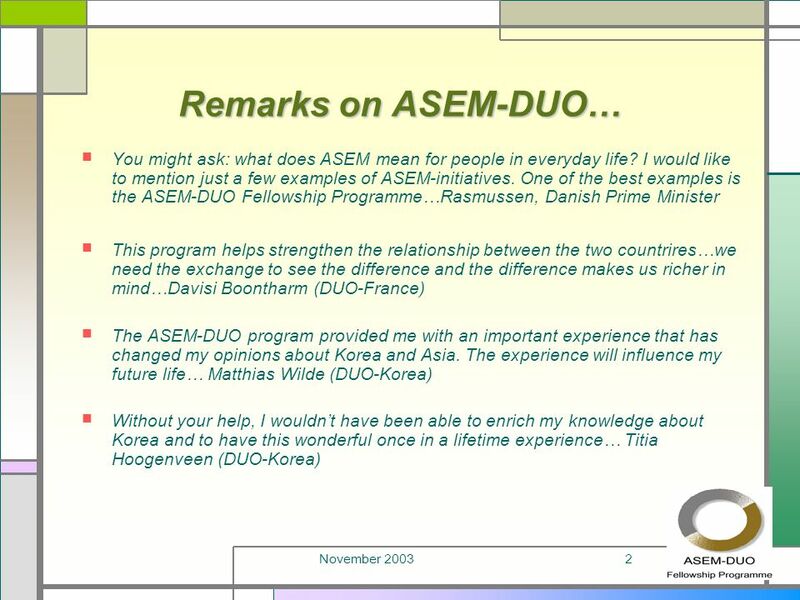 DUO-Singapore Exchange Fellowship Award Progress Report 14 November 2003 Annex D.
ASEM-DUO Fellowship Programme Secretariat for ASEM-DUO Fellowship. DUO-SINGAPORE EXCHANGE FELLOWSHIP AWARD presented by Professor Brian Lee Director, International Relations Office Nanyang Technological University Singapore. 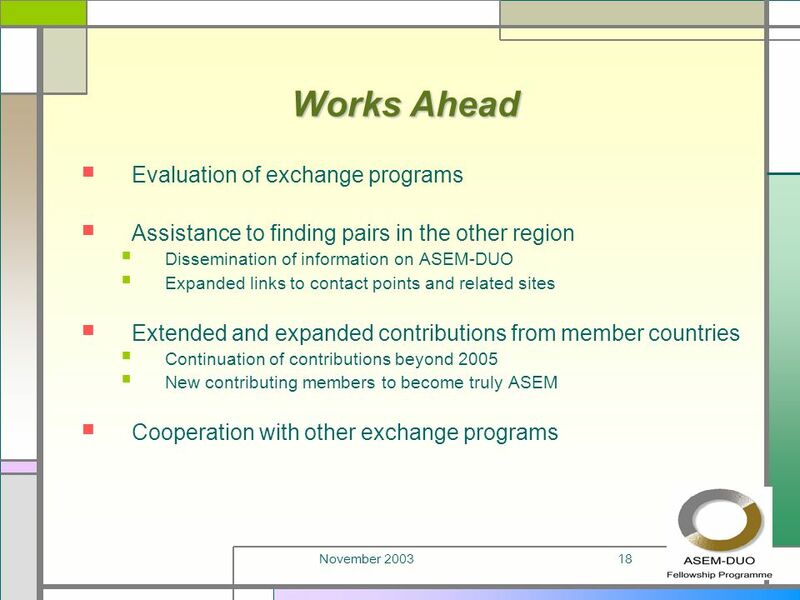 Report on Group One on Integrated Work Programme Martin Owor Assistant Commissioner Head of Disaster Devision Office of the Prime Minister Uganda 23 November. The Role of Citizens in Shaping Public Policy. 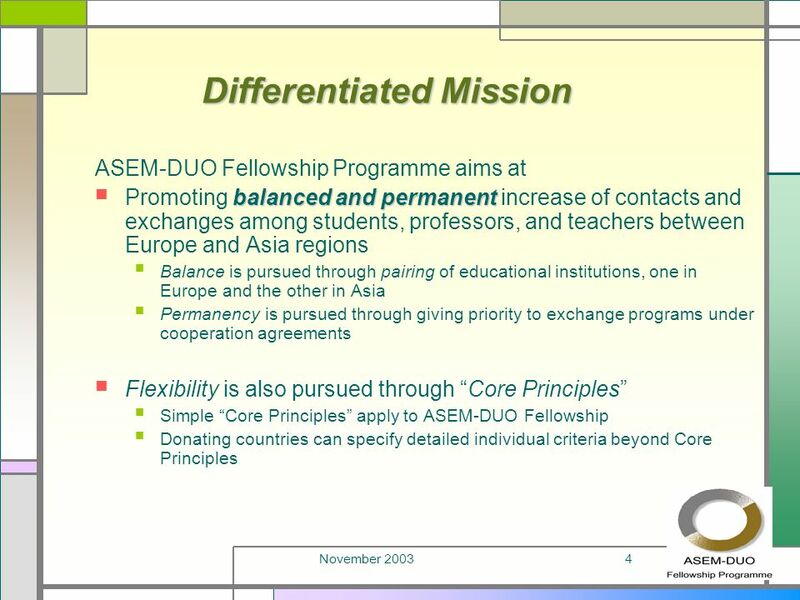 Examples from Italy Giovanni Moro Cittadinanzattiva – Active Citizenship Network BBL at The World Bank Washington. 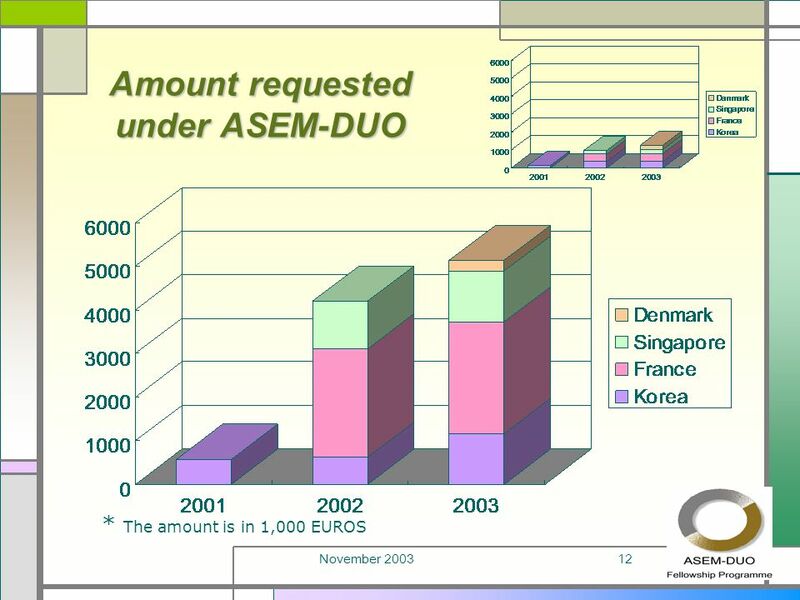 October Government Your Fingertips: Strategic Framework of the World Bank Knut Leipold October 2003. 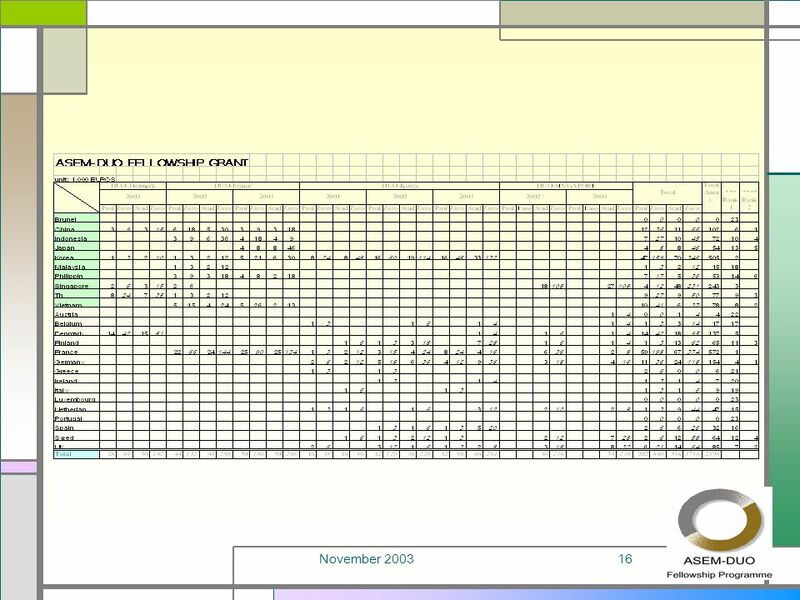 RTAs and SPS provisions Analysis of 194 RTAs – notified and in force as of November 2010 Do the RTAs go beyond the SPS Agreement and if so, in what way? GRIDS infrastructures under the 6th FP Contractual and financial modalities Christophe KOWALSKI European Commission, Information. TEMPUS INFORMATION DAY NEDAL JAYOUSI/Ph.d. NTO PALESITNE TEMPUS IV- FIFTH CALL FOR PROPOSALS.